Reverse Image: Roman fasces, a bundle of rods, the center rod being an ax. Comments: The term 'dime' comes from the French word disme, meaning "tithe" or "tenth part." Because of the resemblance to the Roman god Mercury, the coin became known popularly as the "Mercury Dime". 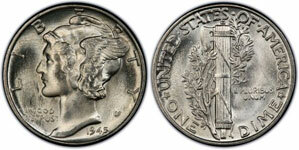 $1.0793 is the rounded silver value for the 1916-1945 Mercury silver dime on April 25, 2019. This is usually the value used by coin dealers when selling these coins at melt value. However, the total melt value is continued below. $1.0809056633 is the total melt value for the 1916-1945 Mercury silver dime on April 25, 2019. The PCGS price guide on Mercury dimes has an updated list of certified coin prices. If you're interested in learning more about grading silver dimes, Photograde is an excellent resource.